Trump Cancels Summit, North Korean Leaders Leave Door Open For Talks : The Two-Way President Trump's scuttling of a meeting with North Korea's leader caused South Korean President Moon Jae-in to call an emergency meeting of his advisers. North Korean officials still want to meet. North Korea's leader Kim Jong Un and South Korea's President Moon Jae-in walk together after a tree-planting ceremony at the truce village of Panmunjom on April 27. President Trump's abrupt announcement he was calling off a June 12 summit with North Korea's leader was met Friday with an open invitation from North Korea to meet "at any time." Trump's decision, which officials said Thursday was delivered in a letter directed to Kim Jong Un, prompted questions and dismay from world leaders. 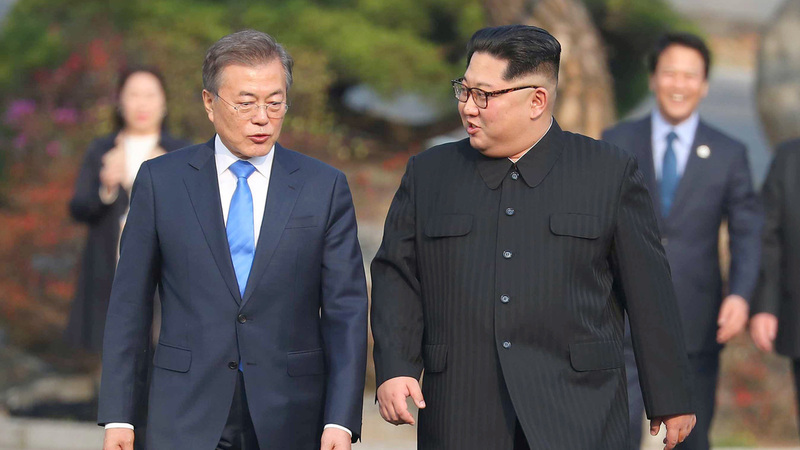 South Korean President Moon Jae-in said he was "very perplexed" by the decision, which he called "very regrettable," according to the South Korean news agency Yonhap. "Denuclearization of the Korean Peninsula and the establishment of permanent peace are historic tasks that can neither be abandoned nor delayed," Yonhap quotes Moon as saying. South Korea's president has just called an emergency meeting at the Blue House, summoning his chief of staff, national security adviser, foreign minister, unification minister and intelligence chief. It's midnight in Seoul. Moon had called an emergency meeting just before midnight local time to try to "figure out" the meaning of the president's letter. "[We] are trying to figure out what President Trump's intention is and the exact meaning of it," presidential spokesman Kim Eui-kyeom said, according to Yonhap. In a statement by Vice Foreign Minister Kim Kye Gwan released to KCNA news service, North Korea still wants to meet with the Trump administration saying, "we are always willing to provide time and opportunity to the US with a generous and open mind." Kim went on to say to the DPRK news outlet, "We have highly regarded President Trump for having made a determination that no previous president could make and for making efforts to realize the historic event of US-DPRK summit." But added, "it is surprising and deeply regretful that he unilaterally and abruptly cancelled the summit." It's not clear whether South Korea, a close U.S. ally intimately involved in the negotiations with North Korea, was informed in advance that Trump was calling off the summit. U.S. Secretary of State Mike Pompeo, speaking to a Senate committee on Thursday, would not confirm whether Seoul had been notified. Moon, who spoke to Kim Jong Un in a historic meeting in April, was in Washington earlier this week to meet with Trump and discuss strategy for the summit. Global markets took a hit on the news that the summit was canceled, according to Reuters. And other world leaders expressed confusion or alarm about Trump's decision. In remarks at the University of Geneva, the secretary-general of the United Nations, António Guterres, acknowledged the development with a brief statement. "I am deeply concerned by the cancellation of the planned meeting in Singapore between the President of the United States and the leader of the DPRK," he said. "I urge the parties to continue their dialogue to find the path to the peaceful and verifiable denuclearization of the Korean Peninsula." British Prime Minister Theresa May said the U.K. is "disappointed" that the talks have been called off, according to CNN. Russian lawmaker Konstantin Kosachev, who chairs the foreign affairs committee in the upper house of Russia's parliament, called the cancellation "a serious blow to peaceful settlement in the region," according to Reuters and Interfax. The fate of the summit, which had been set to take place in Singapore, had been cast into doubt over the past few weeks. On Tuesday, Trump warned that there was a "very substantial chance [the meeting] won't work out." North Korea had been signaling that it might call off the summit itself, objecting to military exercises in South Korea and comments from American politicians. But Trump's letter on Thursday was a surprise to many.